Routines have always been an important part of my life. I’m not one of those “fly by the seat of your pants” type people. I have to plan everything! And I mean everything… my sisters’ joke because I make a list of the lists I need to make before going on vacation! Seriously, a list of lists! This side of my personality is one of the reason’s I love bullet journals so much. It gives me a place to keep all my lists and make them look pretty too! 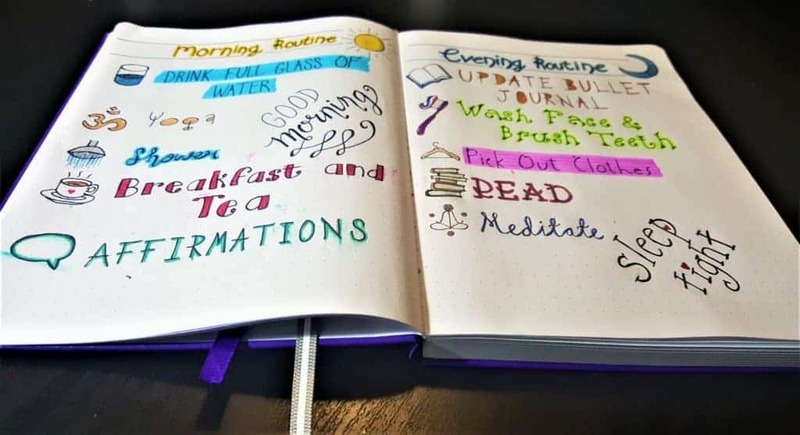 Using your bullet journal to record your ideal morning and evening routine can help you stay focused on yourself and living your best life possible! I firmly believe that everyone can benefit from a structured start and end to their day. It basically means that your thoughts will determine your direction in life. If you think you can succeed, then you will. If you think you can’t succeed then you won’t. Our frame of mind when we start our day is so important. If we start our day rushed, frantic and stressed, then the day is unlikely to get any better. But if we start our day relaxed, organized and prepared, then the day will flourish. The same is true of our evenings before we go to bed. When you have a baby one of the pieces of advice you hear often is to have a bedtime routine for baby. Experts all agree that a consistent bedtime routine helps the baby to know that it’s time for bed and time to unwind. The exact same thing is true for adults. If we have a consistent bedtime routine then we will be subconsciously signaling our mind and body that it’s time for bed. You will find you fall asleep quicker and stay asleep long. Check out my post about Getting a Better Night’s Sleep, for more tips on getting your best sleep ever! When you take time to care for yourself at the end of your day, it gives you a chance to reset your day and prepare for tomorrow. Our bodies need sleep to grow, process memories and refresh our brains. Without quality sleep, our bodies start to shut down and our entire lives are affected. So many people rush around throughout the day, maybe sit down in front of the TV or computer for a few hours and then go straight to bed. They don’t give themselves time to process their day and transition into sleep. Naturally, our bodies want time to transition between day and night. That’s why dusk is such a magically time for humans. It’s not just a pretty sunset, our bodies yearn for that time to slow down and reset before going to sleep for the night. A consistent bedtime routine can do that for you – no sunset required! Deciding exactly what you want to do during your morning and evening routine is a very personal thing. It will depend on so many factors; what time you wake up or go to bed, family members, household or work responsibilities and more. I can’t give you the perfect morning and evening routine. 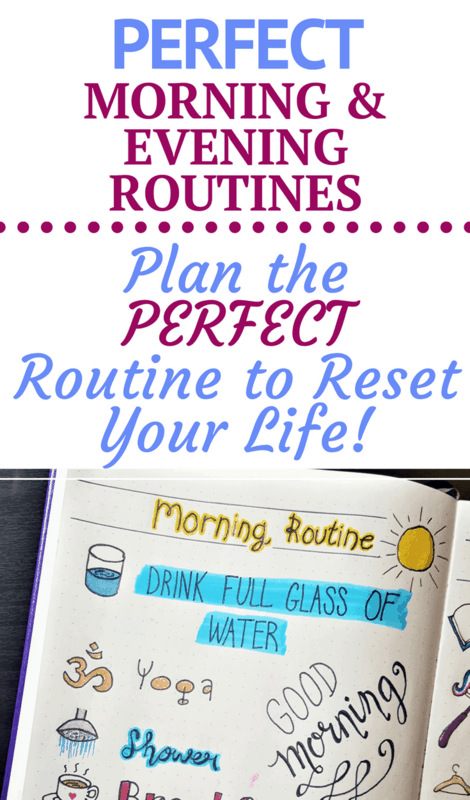 There are no one-size fits all routines. But I can make suggestions for things that you might want to include. Most people find it hard to get up and motivated first thing in the morning. There are a lucky few who are able to spring out of bed and hit the ground running. My mother was one of those kinds of people. Even though everyone says I am a lot like her, that is one attribute I didn’t inherit! 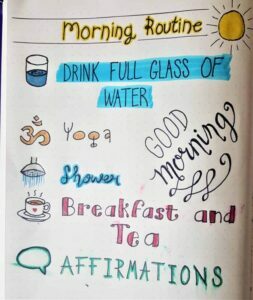 For the rest of us mere mortals, we need to find a morning routine that gently starts our day and energizes us. Of course, you don’t need to do ALL of these. Just pick a few that you feel will fit into your morning well and will help you feel better about getting out of bed each day! A vital part of my morning is yoga. I don’t have time for a full yoga practice (I’m up at 5 am and out the house with 3 kids by 6 am!). I just do 2 or 3 Salute to the Suns. The stretching and movement help to get my blood flowing and wake me up. The other favorite part of my morning routine is my morning affirmations. I actually normally do these in the car driving to work. There’s a great YouTuber called Jason Stephenson, who has a variety of affirmation videos (he also does some amazing meditation and sleep hypnosis videos). I don’t actually watch the videos (I’m driving! ), but I listen to them. The format of Jason’s videos are excellent – he says the affirmation once, then a second time for you to say it with him. He then pauses and gives you time to say it aloud on your own. The videos are all about 20 minutes long, but after just 5 minutes, you will feel more positive and hopeful! Well worth checking out! Positive affirmations are such an underrated practice. I always thought they were a bit crunchy sounding, but after I tried it for a few days, I felt amazing! My perspective on my day completely changed! Give it a try! I’ve talked already about how having a consistent routine at bedtime can help you sleep better, but it’s also a really nice way to end your day. If you’re anything like me, then you enjoy your evenings, but the closer and closer it gets the bedtime, the more you put it off. The sooner you go to bed, the sooner it will be morning and back to work! However, having an enjoyable and relaxing evening routine can help you prepare for bed AND for the next day! Once again, you don’t need to do all these things. You want to pick at least 1 item from each category though. One of my favorite parts of my evening routine is the very last step. My sleep hypnosis or meditation. After my divorce, I was a bit of a mess. Emotionally and mentally I was at my lowest point ever. One thing that helped me recover from those tough times and become stronger than before was using sleep hypnosis. What is sleep hypnosis? First off, all hypnosis is self-hypnosis. There is no way to “force” someone into a hypnotic state. The suggestions of the hypnotist help you get into the right state of mind. Sleep hypnosis is the similar state of mind, but you then allow yourself to drift off to sleep. There are many sleep hypnosis videos on YouTube that you can listen to as you drift off to sleep. If you just do a search for “sleep hypnosis” or “sleep meditation” you will find a large selection of them. I particularly like Jason Stephenson and Michael Sealey (apparently I like Australian accents!). So maybe you’ve decided that you want to start a consistent morning and evening routine (I hope you have!). How are you going to stick with it? I find my bullet journal to be my biggest help in sticking to any routine. 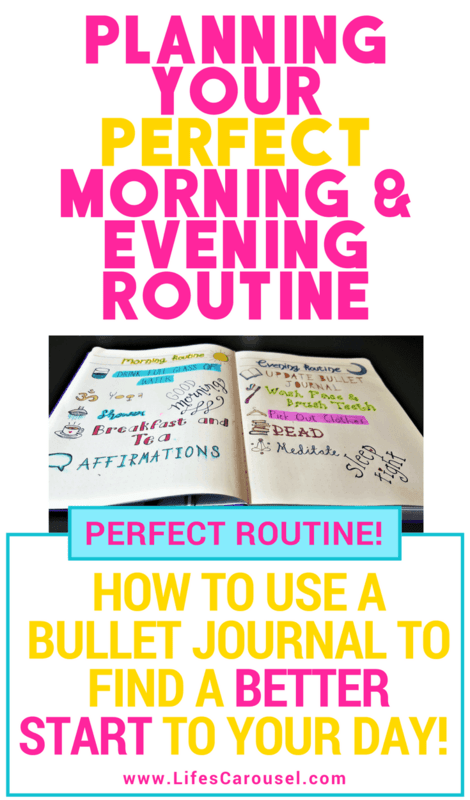 Want to find out more about starting a bullet journal? 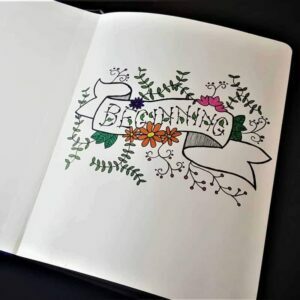 Check out my Complete Beginners Guide to Bullet Journals. The first 2 pages of my brand new bullet journal are dedicated to my morning and evening routine! I took some time to do a little bit of artwork too (I’m no artist!)! By taking the time to put my routines on paper, I became more invested in them. It also clarified to me, exactly what I want to be a part of my routine. I got rid of all the extra stuff, and just had the bare bones. The minimum that I want to do each morning and evening. 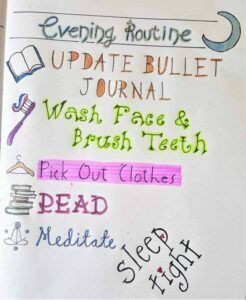 Another way that your bullet journal can help you with your routine is to have a tracking page, and track each day that you complete all the steps of your morning and evening routine. I track lots of different things in my bullet journal. But tracking my health and self-care are some of the most important to me. 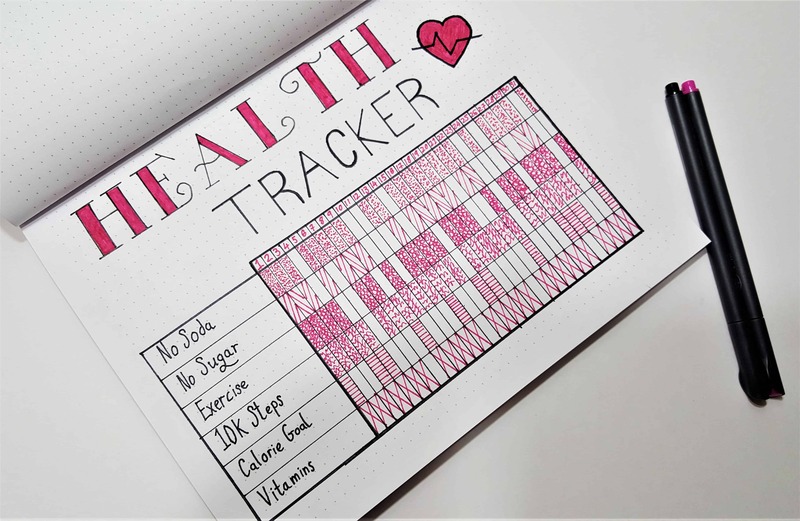 Here’s a health tracker spread that I use to make sure I’m looking after myself. 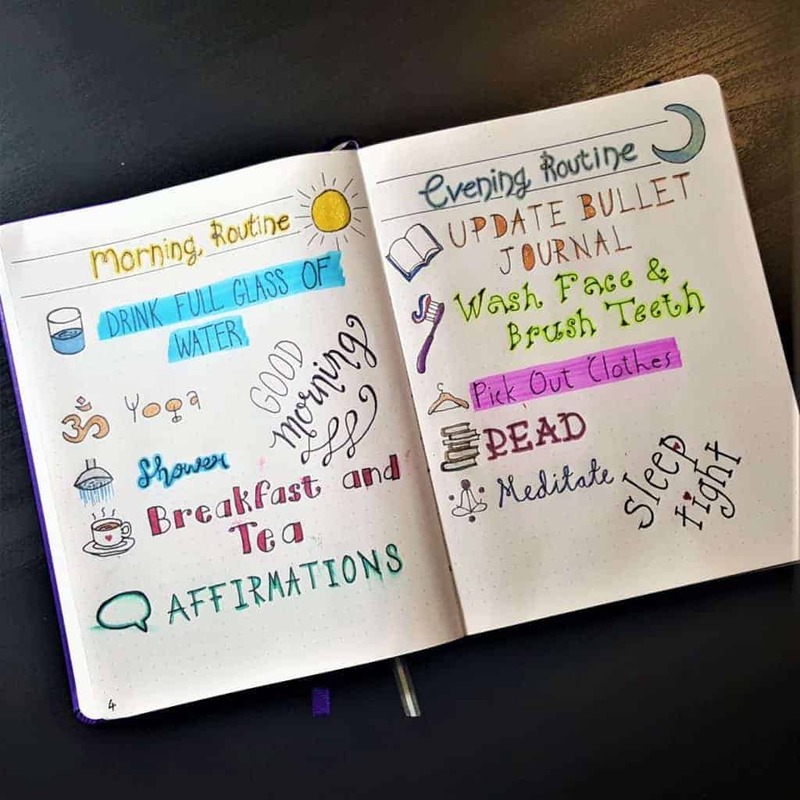 You could use a similar tracker layout for your morning and evening routines. So now there’s no excuse for not starting a morning and evening routine. What things will you add to our routine? I’m glad I’m not the only one to not inherit that trait. My mom didn’t drink caffeine either! Glad you liked the post.